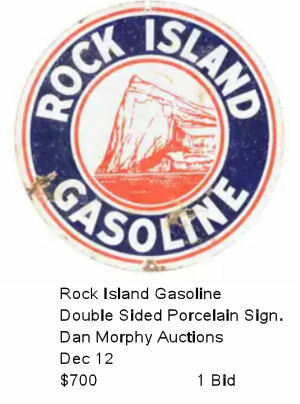 The value of old or vintage porcelain enamel signs depends primarily on three factors; rarity, condition, and design. Age may have a slight impact on price, but rarity and condition are the real price drivers. 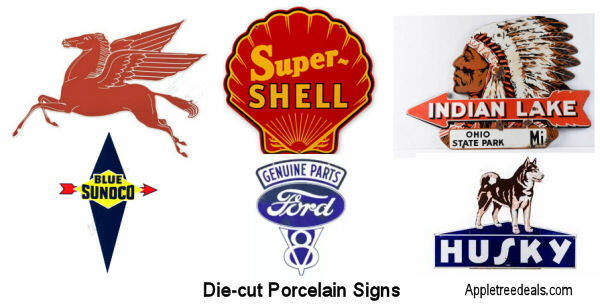 There are other factors that determine a sign’s value, like; demand, brand, and size, that can be almost as important as condition and design, but most collectors of old advertising signs are display collectors, so of course they will buy rare and unusual signs, but they will also pay top dollar for “common” signs if they are in excellent condition. Whether it is a desirable rare sign, or a common entry-level sign, condition can be a price multiplier, or a price chopper. As can be seen by these auction-estimate prices of nearly identical signs, the Near-mint* sign on the left, (Fig.1), could typically sell for several thousand dollars, but the Used Beat-up* sign on the right, (Fig. 3), would probably sell for only a few hundred dollars. 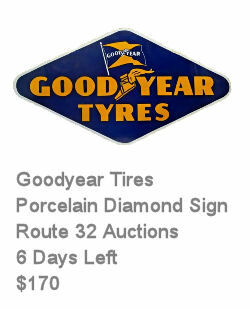 Examples of Porcelain Signs Condition Prices. The majority of old sign buyers are collectors building a display, whether it is for a room like a Man Cave, a garage, or a replica of a gas station or service area. The most valuable signs are ones that have great “eye” appeal, from both a distance, and close-up, but display space – usually a wall or door panel – is a prime consideration. A six-foot Mobil Gas Pegasus might look impressive, but where to put it can be a problem. The same thought applies to small signs. A collector might have a spot for one or two door-push signs, but other than on a door – they may be hard to see from a distance. The most popular, and thus most valuable, advertising signs are in the 28″ – 44″ range. They are easily displayed, and they look good from a distance. This doesn’t mean other larger or smaller signs aren’t valuable, it just means there is less demand, so value prices are generally lower. These two examples aren’t identicle, but they do show the concept that size affects value. This Ford sign, (Fig. 1), is 64″ x 22″ – a large sign that would take up most of a wall. Fig. 2 is a smaller sign – 24″ x 10,” and is also a fairly common sign, and even though it is not quite as good condition as Fig. 1 – it sold for $335. Display size and flexibility was almost certainly a factor. 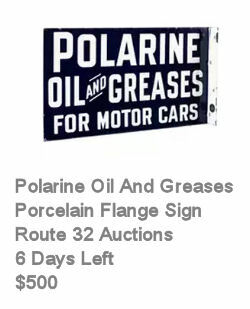 One example of popular vintage small porcelain signs is the market for what are called “Door Push” signs. These are just what the name says – they are placed on doors as handles, or handle placements. They may not draw the multi-hundreds of dollars a bigger sign gets, but for premium value and collector demand, they command premium prices. From $40 to $400. Demand covers different areas. It covers the obvious; signs that are popular choices, or rare, but it also covers Brand, and Design, such as; Die-cut signs. 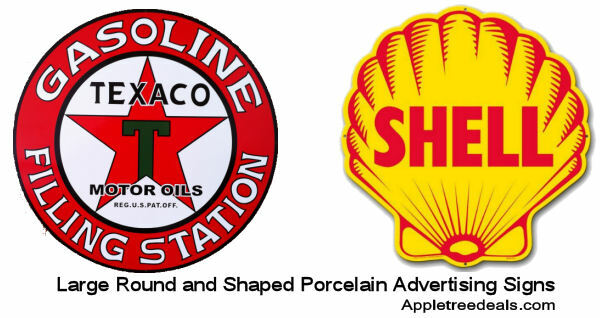 Top brands like; Texaco, Mobil, Esso, Shell, Gulf, etc. are always in demand and draw premium prices, but because these signs are also plentiful, their price value is very dependent on condition. Other, less known brands, like; Magnolia or Olizum Oils can also be in popular demand. Die-cut signs are also popular. These are shaped signs, not just round or square. 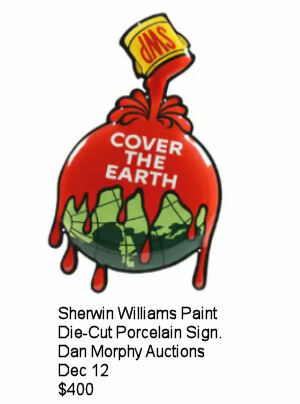 Unlike most collectibles markets, in the porcelain, or porcelain enamel sign collector’s world age isn’t usually an important factor, other than contributing to rarity. 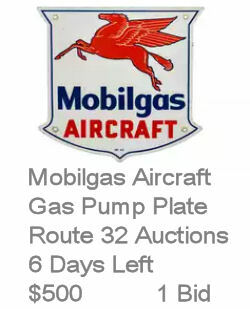 A 1950’s version of a desirable sign will usually command the same price value as a 1930’s version. 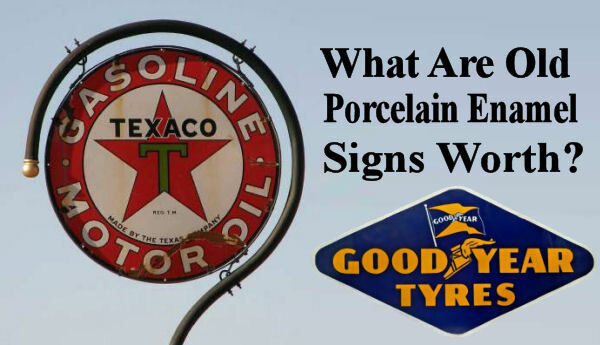 What are porcelain advertising signs worth? It is impossible to place an exact worth on individual signs. Besides all the mentioned variables that affect price, there is the unpredictable factor of current collector demand, and the reality of getting lucky – or not – in finding collectors that are looking for a particular sign at a particular time. Other than getting an estimate from an auction house buyer, or a direct appraisals from collectors, the best that can be offered are general price ranges – based on recent past sales. 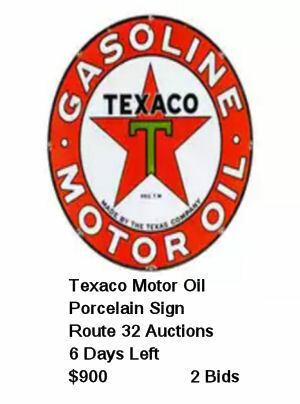 *See more porcelain advertising signs available right now! *See more mid-size porcelain advertising signs available right now! See ALL Porcelain Signs on Amazon now!